You might have any number of goals for New York City's transportation policy in the near future. Let's say you want to cut something in half. It could be our greenhouse gas emissions, or the amount of gasoline burned in the city, or the number of people killed in road crashes, or the childhood obesity rate. In order to do any of these things, let me repeat, it's not enough to get people to take transit. You need to get people out of their cars. If you're genuinely fighting for "balance" or "choice," you won't accomplish your goals. 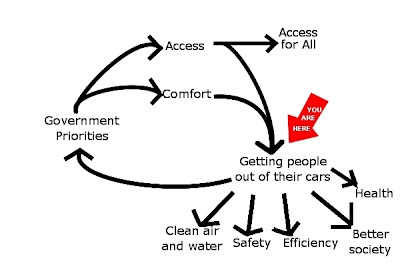 Remember that if transit is more efficient at providing access for subsidies than roads are, if people patronize systems depending on the access that they provide, and if subsidies are distributed based on usage, then transit will grow by itself, and we don't have to do anything. But if we're concerned that corruption may be skewing the distribution of subsidies, or if we just want to help the process along, then we can apply pressure. Pressure in one direction moves the cycle towards car dependence (and thus towards carnage, pollution, obesity and inefficiency), and pressure in the other direction moves it towards transit use (and thus towards health, safety, efficiency and clean air). So here's my question: at what point will we have a solid majority of the City Council in favor of prioritizing transit over cars? At what point will we have a solid majority of the city's Assembly delegation, Senate, Congress? Right now, as we know, 55% of New Yorkers take transit to work. You would think that there would be a solid majority in the City Council supporting transit. But car ownership (and transit use) is spread unevenly across the city, leading to the possibility of a Council dominated by powerful blocs of members from Eastern Queens, for example. Still, that doesn't explain it all. It doesn't explain why even Bill Perkins and Tom Duane were wishy-washy on bridge tolls. It doesn't explain why Dan Garodnick thinks that the primary concern of "the community" is curbside car access rather than faster buses. In these three districts, less than 30% of households have a car. I'm beginning to think that changing the perceptions and priorities of our elected officials is more important than changing the composition of their voters. The politicians love whipping the MTA, not contributing to their success. The MTA is far from perfect, but they are actually trying to run a transit system. The city is trying to do things just to pull down available grant money. Like I said on one of your older posts, 55% of New Yorkers may take transit, but the percentage is lower among those who are US citizens, and even lower among those who vote. Exclude unnaturalized immigrants, students registered to vote elsewhere, and people who just don't vote (mostly poor and young), and you'll probably get a large driving majority. Alon, you forgot my response to that comment. Alon Levy: You have to consider that areas like the Upper East Side are very wealthy, yet most people take public transportation to work (I think something like 8% of commuters take a car or carpool to work). If you go out to Far Rockaway, which is a low-income area, you'll find closer to 30-40% of commuters using a car. Overall, drivers are probably wealthier than transit riders, but it isn't by the margin that it is in thoer cities. Also, you have to consider that many people can have a car, but still take public transportation to work, or at least have relatives that use public transportation frequently. My family has one car, which is used for commuting purposes, but only one parent uses it: The rest of the family takes public transportation to get around. Politicians are amazingly responsive to the tiny voting constituency that their district offices hear from over the phone and at public and private meetings. Councilmember Garodnick's strong support for curbside access is a classic case of this. You'll hear them standing up for transit causes like lower MTA fares, writing op-eds in the Daily News strongly condemning transit cuts and the like, but this is meant for the broader voting public and the broader voting public cares about good transit service but it is also not overriding for them like it is for the little old ladies on 34th street who want to be dropped off right in front of their doors. You don't want to cross those little old ladies i guess. I think politicians will start changing their minds about the importance of transit when they start hearing directly from constituents who care about it, and this includes all the hospitals and large employers in the outer boroughs who are getting squeezed by insufficient transit access and way too much traffic congestion (read: SUNY Downstate/Kings Co hospital in East Flatbush). Because of territorial rating, car insurance in most parts of NYC is many times higher than most other parts of the country. E.G. A 25 year old female Brooklyn resident will pay 5 times more for the same insurance plan than if she lived in Binghampton. Given the cost of housing, it wouldn't surprise me if car ownership rates were much much lower among the poor in NYC than anywhere else in the country.